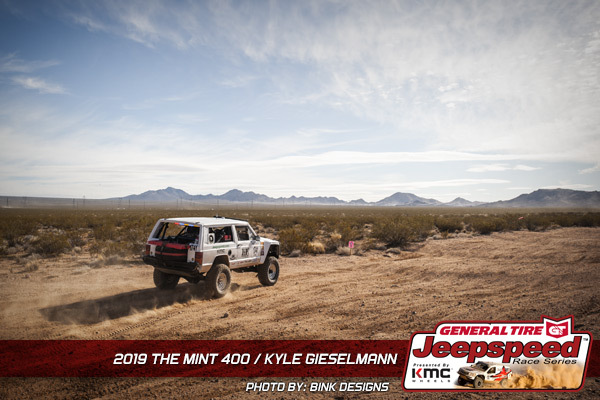 Mother Nature had a last minute surprise for Jeepspeed racers at the Best In The Desert Mint 400 offroad race in Las Vegas, Nevada. Steady rains fell in the desert only days before the race. Not only did it fill Jean dry lake bed with 2 feet of water, but the intense downpours also made the course especially rough. The flooded lake bed soon subsided, but the rain had a much more lasting effect. The terrain there is very rocky. When the rains beat down with enough force, it washes the dirt from between the rocks, causing the course to be little more than a pile of loose boulders. Those rocks cause all kinds of problems. They can act like ball bearings, causing control problems in the corners. They can cause flat tires, and broken wheels, and they can get kicked up causing damage to suspension parts, or worse. The constant beating also takes a toll on the vehicle occupants. The course becomes a huge cheese grater. Like a cheese grater, it shreds the competitors until nothing is left. Despite such demanding conditions, Jeepspeed racers still managed to push the pace and take it to their fellow competitors. One of the fiercest battles was in the 3700 Jeepspeed Outlaws class. 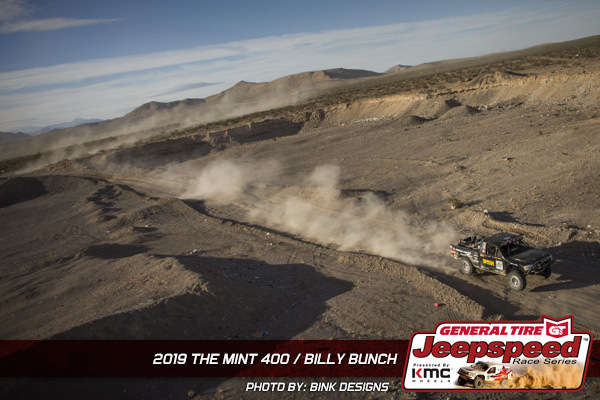 After Billy Bunch and Jesse Archer moved up into the 4700 class (They won 4700 at the Mint), some thought the competition would not be as fierce but they proved that false at the Mint. There was a spirited race at the front, and every 3700 racer entered made it to the finish. Winner Eric Sigwing said it was uneventful, but after digging a little, there was more going on than thought. Anytime you can do the entire race without getting out of the truck, it seems like a walk in the park. He did give credit to good preparation and fast pit stops. “We swapped the lead with 3714 a couple times on lap one, but once we got a little time on them on lap 2 we never looked back,” said Sigwing, “It was a really rough course but we didn’t skip a beat; we had so much fun. Even the weather was awesome. On lap one we shifted into 2wd to cross the lake bed (They were doing over 100 mph). On the second lap we just kept it in 4wd and stayed around 90 mph. I have a new co-driver this year, Thomas Rainer. I love to hit big jumps, and keep it to the wood. He’s more methodical. He kept us on the winning pace.” Scott Dzierzanowski finished 12 minutes behind Sigwing, and Robert Thomasson finished around 12 minutes behind him. They finished in the same order at the previous race in Parker; the only 2 to make it to the finish there. “We had a rear start but that’s good because every truck we catch is a truck we have time on,” said Thomasson, “We were making good time off the start, but when we got to the quarry we ripped out a sidewall on a tire. We were back in 4th or 5th. We had a clean race the rest of the way to the podium. The course was real rough; the roughest in a while. The rain washed a bunch of big rocks into the middle of the course. You just don’t charge as hard as usual because you don’t know what’s around the corner. 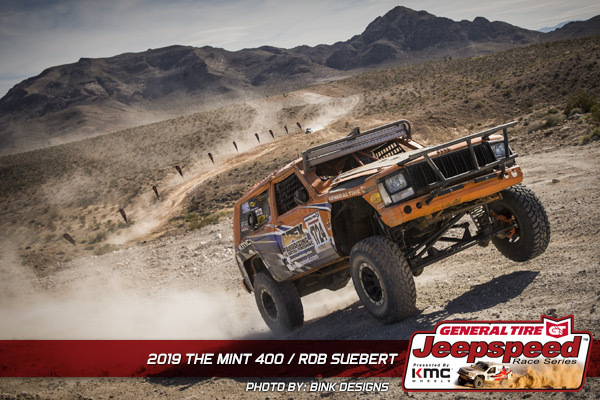 You can make mental notes about the big stuff on the first lap, but you really can only drive what you can see because it changes so much.” 1700 Jeepspeed Challenge winner Rob Seubert had a wild one on the way to the win. In the infield section off the start, he carried too much speed into a left turn, hooked a rut, and ended up rolling up onto the roof and then back onto the passenger side. “We called our pit crew, who sent BITD to our rescue,” says Suebert, “We sat on our side for 19 minutes. Although we couldn’t see anything but dirt, we heard the rest of the trucks that started behind us go by. We learned a valuable lesson when BITD pulled us back upright. Be sure to lower your helmet visor. We took a dirt shower and a pile of dirt went right into our faces. Back on all fours, we fired up the jeep and took a more cautious approach to heading down course. The Jeep was handling great, I was just a little rattled from rolling it over. Dustin kept telling me to step on it. Just before the gravel pit, we started seeing some of our competitors. We got a couple places back and then started feeling a little better. We continued to pass vehicles and eventually had 1770 in our sights. We worked past him not too far from the main pit. As we got into radio range of our main pit, we got word that 1710 was out of the race. This got us trying to recall all the class 1700 cars we had passed. We started to think we may be actually leading until we caught a glimpse of 1741 in front of us. We entered the main pit for fuel and a first real check of the Jeep since rolling. The crew found a broken left front limit strap bracket. Not much we could about that. We had a spare strap, but not a bracket. I would have to try and keep the front end on the ground for the second lap to keep the shock from pulling apart. As we exited the main, 1770 came to the merge from a different path, and was back in front of us; putting us back to third.” “We hung with 1770 and harassed him into moving over for us to take back second place. Catching glimpses of 1741, I pushed in the chop and made up some ground. When we came into the big rollers, I had to back off to keep the front on the ground as much as possible and we lost some ground. Back to chop and we gained some back again. This went on for more than half the second lap. Eventually we caught up to striking distance and got around 1741 in a real wide spot on the course. Astounded that we were leading, and knowing we just had to stay in front of 1741 (as we were on the same start time), we conserved as much as possible. We had to keep from destroying the shock or getting a flat. Other than a little back and forth with yet another vintage car, we crossed the finish line with no drama. Amazingly, even with a roll over, Dustin and I never got out of the car. We feel like we stole this one, we had some bad luck, but others had worse luck.” Number 1741 Kyle Gieselmann was able to maintain his position to finish second place. Taking the final position on the Jeepspeed Challenge podium was Joel Miner. “This one started off with our usual excitement,” said Miner, “My regular navigator Doug was injured a week before the race, so Lonnie stepped up. He hadn’t raced the mint (Nissan) 400 since 1991. As usual, everything was new for us, including contingency. I had no idea that we had to push the car so with Megan in the driver’s seat, I tried to push the jeep through on my own. That dang thing is heavy. The crew showed up to help, and rest of contingency and tech was pretty uneventful. We knew our poor little 4.0 got hurt in testing and was using a bunch of oil, but weren’t going to miss our second race of the year. The decision was made to go for it. I haven’t run any of these courses before, so I asked around a bit and got some good advice from the 1780 guys on what was out there. We drew the last starting position and ended up lined up next to the 1741, figuring I have never run an infield section, we would let them go and try and figure out how this would work out. Lonnie and I were off and having a good time. I think we may have even made a pass before the bridge. Being at the back, the dust was pretty bad, and we could only get her up to about 82mph on the lakebed. We figured we would just run our own race, and get to the finish. I didn’t know it at the time, but I think we were first on the road into pit B. We had to stop and add a few quarts of oil, and some power steering fluid. The 1741 passed us as we were stopped. We decided we were doing well, and should back it down a bit to make sure we would get to the finish line. As we drove though main pit, Mike held up 2 fingers and I said that can’t mean we are in second place can it? Lonnie reminded me we had a long ways to go and don’t over drive it. As we exited the pit, the 1724 was right behind us. We let him go figuring I didn’t have the power to keep up. We drove into pit A on the second lap for some more oil, and power steering fluid, and our crew informed us where we were sitting. Megan was running the pits with usual navigator Doug fueling. We had some clean stops despite all the fluids we had to add. Lonnie and I had an uneventful race after that; just trying to get to the finish, and hold on to our podium spot. It was our first race on the General Tire 10.5 on our KMC Wheels, and I really liked them; we had no tire issues. I couldn’t be happier with our team getting the car on the podium in our third race. 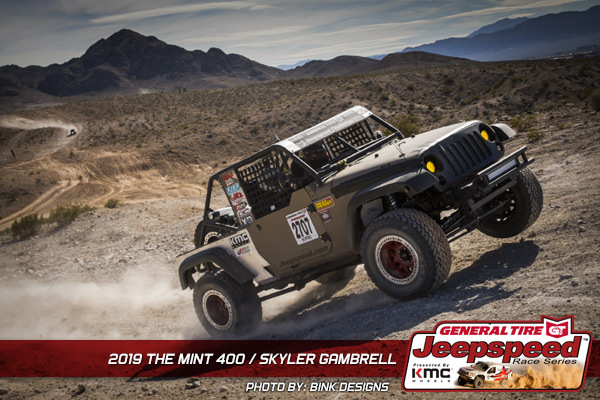 After finishing we even got to get the motor pumped and rest of the car inspected to make sure we were legal which was cool.” Class 2700 Jeepspeed Cup competitor Skyler Gambrell debuted a brand new Jeep Wrangler that, like many Jeepspeed racers, he built himself. He and Chris Clark would be battling against each other for the win. “After roughly a year, we got the Wrangler JK that we have named Gomer Pyle ready for its maiden voyage,” said Gambrell, “After an easy roll though tech, we stickered up the still tacky paint and headed back to state line to do final check on the Jeep. Big thanks goes out to Mike Barnett and Mark Kammerlohr at Jeepspeed main for their support, and the great offer to help pit from Wolfpack racing and Tim Martins crew. It was nice knowing that there were people out there willing to help, especially in a brand new, untested car. We staged next to Chris Clark, and pulled the holeshot off the start. The 3.6 Pentastar is a very potent power plant, and mated up with the 6 speed manual trans, it was fast when I could go fast. The untested shock package was brutally stiff, and really hampered all out speed through the middle sized chop. At race mile 60, a passenger side lower shock mount decided it had enough of the rigid shocks and peeled off the axle. We removed the shock, and drove on the bump stop for about 8 miles to pit B. Tim Martin and his crew member were there with a welder, wish I could remember his name! He hammered the mangled mount back into submission and welded up a fix that was better than new. After making it back to the main pit, the awesome Jeepspeed crew topped me off with fuel; I got roughly 10mpg that lap. They put the light bar on, and we set off into the setting sun, now knowing that we were sole 2700 left in the race. A survival lap was all that was needed. As mile after mile passed, the suspension seemed to get stiffer, and stiffer. We were getting punished badly. I slowed as much as I could, but even at 10 to15 miles per hour, I could feel my kidneys smacking other internal organs. I moaned, and cussed to the point that my co driver said either I had to shut up, or he was going to unplug his intercom. Finally making it though that painful lap, we sloshed around a ridiculously over watered infield section, and crossed the finish line. We got the checkers, and a class win right out of the box! A huge thanks goes out to Clive Skilton, the Jeepspeed crew at main pit, Wolfpack Racing, and the NURD offroad crew. I owe all of you guys!” Racing in the Jeepspeed is challenging, and rewarding. Designed to be an affordable racing series, Jeepspeed racers benefit from strong sponsor support. 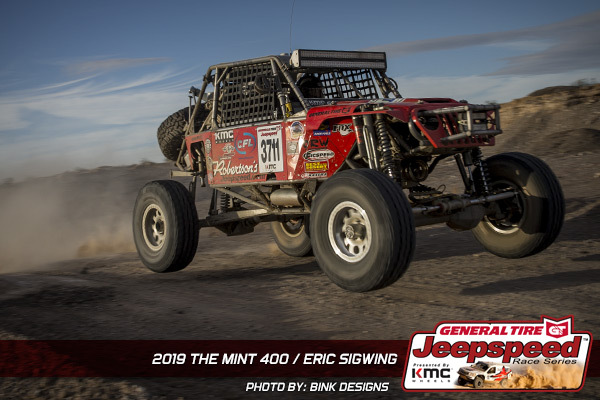 In addition to the Southwest Boulder & Stone bonus money at every race, Jeepspeed racers also get the normal prize money offered by Best in the Desert, plus contingency awards. Tuff Stuff 4X4 gives offroad accessory products to the winners of each class at each race. NEO Oil supplies a case of oil for a win with their decal in place, and Action Sports Canopies will be giving away a canopy for the overall Jeepspeed champions at the end of the season. The support for the Jeepspeed series by sponsors General Tire, KMC Wheels, Currie Enterprises, Action Sports Canopies, Southwest Boulder & Stone, GG Lighting, Jasper Racing Engines, NEO Synthetic Oil, Rugged Radios, Tuff Stuff 4X4, Rock Krawler Suspension, King Shocks, and T&J Performance helps to make the series very affordable, and contributes to the excellent quality and performance of the vehicles. The Jeepspeed series has very simple rules that allow you to build your own vehicle if you choose, and has 4, progressively more modified classes available. It’s even possible to make changes to your existing race truck and move up into faster classes as you go. Jeepspeed is the best series for the average racer as the costs are reasonable, the sponsor support is very strong, and the fun level is off the charts. Think you would like to give Jeepspeed racing a try? For information about the Jeepspeed racing series go to www.jeepspeed.com. There you will find additional info, deals on some attractively priced race Jeeps for sale, Jeepspeed news, rules, forums, race results, videos and much more. 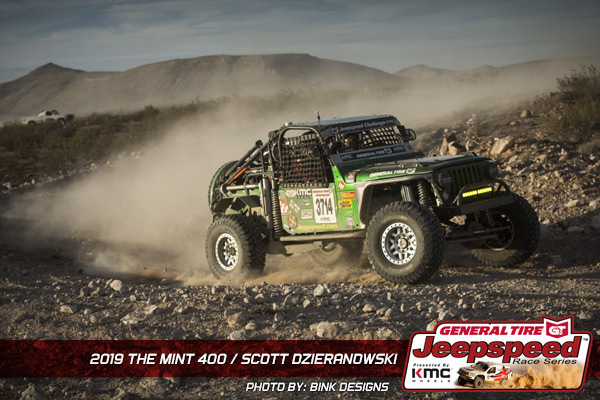 Go to the Jeepspeed forum and you can read in-depth race reports from many of the Jeepspeed teams. The next race will be at the VT Construction Silver State 300 May 2-5 in Las Vegas, Nevada. Whether you show up as a competitor, or as a fan, you won’t want to miss it.